I think Oscar Wilde was a feminist! Who knew? Well, probably a lot of people, especially Jenny, but not me. After reading a string of very depressing audiobooks, I really needed a pick-me-up. Oscar Wilde was it! I picked A Woman of No Importance because it was short and funny and witty and had an interesting title. And it was a winner! 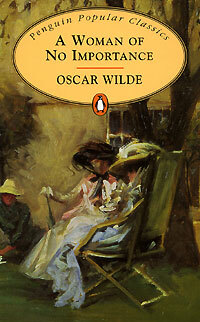 Apparently, this is not considered Wilde's best work. I suppose that is reasonable as An Ideal Husband and The Importance of Being Earnest are quite good, but I really enjoyed A Woman of No Importance, too. It hit on so many important themes and never once stopped being fun. The audiobook I listened to was also excellent. Honestly, I feel like a well-acted play on audio is a window to the golden age of radio, because the sound effects and the big casts and all that are just SO FUN to listen to. I want to listen to more like this. So, the play. It is set in an English country house, and an up-and-coming young man from a middle-class background has just been offered a fantastic job as secretary to an aristocrat who is quite rich but also not a very good person. People are pleased! Except for the young man's mother, who does not want him to work for such a scoundrel. And then there is the young man's lady love, who is a Puritan and just wants to make sure that if women suffer for their sins, men suffer, too. But to be clear, everyone should suffer for wrong-doing. You are likely to understand exactly what is going on in this book within about ten minutes (which is probably required, as the book was only about 1.5 hours long), and who cares? It is so much fun to read and the one-liners are so excellent and the cast is so spot-on with their droll aristocratic ways and their earnest middle-class ways and their sincere American ways you can't help but love everything. What was the BEST, though, was the way that Wilde pointed out the double standards that existed at the time. There is, of course, the point that a man can be a complete screw-up and horrible person but people think he's da bomb diggity, anyway. But if you're a woman and do the same thing, you are a social pariah and have to give up going out to parties and having fun and being a person. I followed up A Woman of No Importance with Sheryl Sandberg's Lean In, and I must say, the two books have many parallels. Basically, we all have different standards for men than women, and women suffer for that. Men do, too, but to a lesser extent. Certainly, the white male aristocrats suffer the least. What I also loved about this book was the ending, though I suppose telling you why would be a spoiler Just know, though, that it is a good one and not sappy and stupid and moralizing like many Victorian endings are. So! Read this! Or better yet, watch it live or listen to it on audiobook, because that would be way better than reading stage directions, I assume. I read this a while ago, and I remember definitely being like WOAH! Oscar! Yes! And I didn't get that it wasn't even the best of his plays, because it's so good! I am exclaiming too much, but really, I like Oscar Wilde quite a lot. I've read none of Oscar Wilde...it's a real deficiency in my reading! I listened to a bunch of his plays awhile back but I can't remember if this was one. They were fun and entertaining though! There was a film in development, with Sean Bean, Annette Bening, and Amanda Seyfried, but it's been so long since there was any news about it that I'm afraid it will never come to fruition. Too bad, because I love the modern interpretations of Wilde plays. There are no emoticons to approximate the happiness of my face right now. I always always want praise for Oscar Wilde, especially well-deserved praise such as this. Isn't he the best? Don't you think it would have been great fun to have been his friend?